Day dreaming about our time in Umbria last fall got me thinking about farro, the nutty grain often used as a substitute for pasta throughout the Umbrian countryside. It was these and other memories of the delicious food we ate during our trip that inspired me to make Lidia Bastianich's Farro with Pork Ragu. Trim the fat from the exterior of the pork. Cut it into bite-sized morsels, about 3/4-inch cubes, trimming more fat and bits of cartilage as you divide the meat. Pat the pieces dry with paper towels. Pour the olive oil into the big pan, set it over medium heat and toss in the pork. Spread the pieces in the pan and season with the salt. Cook the pork slowly for 15 minutes or so, turning and moving the pieces occasionally as the meat releases its juices and they cook away. When the pan is dry and the pork starts to sizzle and crackle, clear a hot spot on the bottom and drop in the chopped garlic and peperoncino. Stir and toast them for a minute or so in the hot spot until the garlic is fragrant and sizzling, then stir and toss with the meat cubes. Raise the heat a bit, pour in the white wine, stir and bring to a boil. Let the wine bubble until it is nearly evaporated and the pork is sizzling again. Pour in the crushed tomatoes and a cup of water that has been sloshed around to rinse out the tomato can, grate on the fresh nutmeg and stir. Cover the pan and heat the tomatoes to a boil, then adjust the heat to maintain a steady, gentle perking. Cook for about 1 1/2 hours until the pork is tender all the way through and falls apart under gentle pressure, and the sauce has thickened. If the liquid is still thin toward the end of the cooking time, set the cover ajar and raise the heat a bit to reduce it rapidly. Meanwhile, prepare the farro, first rinsing it well and draining it in a sieve. Put it in the smaller saucepan with 6 cups cold water, the bay leaf, salt and olive oil. Bring to a boil, stirring occasionally, then set the cover ajar and adjust the heat to maintain a steady simmer. Cook about 30 minutes, stirring occasionally until the grains are cooked through but still al dente. Turn off the heat, pour off excess liquid and keep the farro warm until the ragù is done. To finish the dish: Have the ragù simmering and stir in the farro thoroughly. Cook together for a minute, so the grain is very hot. Turn off the heat, sprinkle the grated cheese on top and stir in. Spoon the dressed farro into warm bowls, and serve immediately with more grated cheese at the table. Classic rustic cuisine ~ Yummy + THE comfort food. Don't you just love re-creating foodie memories? Thanks for sharing this one!! I've never made this dish before, and I generally am not a pork fan, but this is totally making my mouth water! It looks so delicious! 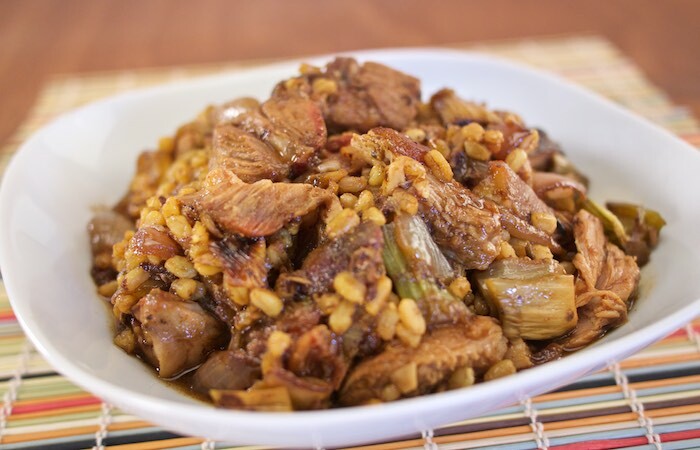 This Farro and Pork Ragu looks like some serious comfort food! That looks soooo flavorful, I'd love a serving of it right now! Wow this sounds great! My husband would love this meal, he loves pork shoulder. That sounds like one cozy dish! Farro is an interesting ingredient for sure. You don't see it used often, but I like the texture and flavour it adds to recipes. This looks like great comfort food. This is on my favorite foods list. Pork shoulder is the best! I have never made or heard of farro but it looks delicious!! Thanks for sharing. So hearty and delish! I should really use farro more. Thanks for inspiring me! I love farro and this is such a great recipe for it. This recipe sounds AMAZING! I will definitely be adding this to my meal list!